NVU and KompoZer are free website design programs that offer good functionality if you are trying to create a simple website. You can download NVU or KompoZer (the next generation NVU) in just a few minutes and start creating your website with a graphical interface that makes it easy to create a website in a very short period of time. Once you have your site design, you may want to add videos or music. It is a fairly painless process if you already have a good grasp of NVU. KompoZer actually adds a bit more functionality and is even more user-friendly than NVU with a better graphical interface on your computer as you design your site. If you want to have videos on your NVU website, I highly recommend not storing them on your server. Videos are space-hogs and putting your video up on sites like Veoh, YouTube, MySpace or other video hosting sites is the best way to conserve space and also get more exposure in the market. If you don’t have the time or resources to make your own video, putting relevant videos on your site from others can be an easy way to enhance your site and engage readers. YouTube has videos on just about every topic imaginable but there are hundreds of other sites that allow you to embed videos on your site by inserting a simple embed code into your HTML. Adding videos to your NVU or KompoZer site is easy and fun and can be done with a few easy steps. Including videos in your NVU website is a simple process. 1. Get the embed code from your chosen video server. 2. Start up NVU (or KompoZer). 3. Load the web page where you want to place your video. 4. Move the cursor to where you want to place the video on the page and click. If you want more than one video on your page, it is often helpful to first insert a two or three column table to accommodate your videos. 5. Open "Insert" – "HTML" from the dropdown menu. 6. Copy and paste the embed code that you have from your video host into the dialog box and click on insert. 7. Upload/Publish your web page. 8. Test the page from your browser. Voila, you have video on your NVU site. NVU does not show the video in either "Preview" or "Normal" modes but you will see it in the published version when you go to "yoursite.com" (replace with your site name, of course). KompoZer does show the placement of the video. Using tables and inserting the video in the table can sometimes make it a lot easier to work with multiple videos on one page. YouTube is a must if you want exposure for your video. Simply set up your YouTube account, load your video and get the embed code from YouTube. YouTube prefers that videos be submitted in H.264, MPEG-2 or MPEG-4 formats but you can also submit .AVI files if you happen to be using a program like Windows MovieMaker to create your videos. Embedding an existing video from YouTube on your NVU website simply requires that you copy the embed code from YouTube into your chosen web page. Simply select the options you would like (size and frame color), then copy the embed code from YouTube and paste it into your site. Veoh adds a whole series of videos depending on what videos you download. Set up your Veoh account, upload your video, then go to your video and copy and paste the embed code into NVU or KompoZer as set out in the above instructions. Veoh is great in that with a few simple clicks you can also post to Facebook, Myspace, Twitter, Digg This, Delici-ous, and StumbleIt as well as embed the video on your website. Once you start adding videos to your site, you might find it addictive. It is a quick easy way to make your site more interesting without having to mess with a lot of graphics. 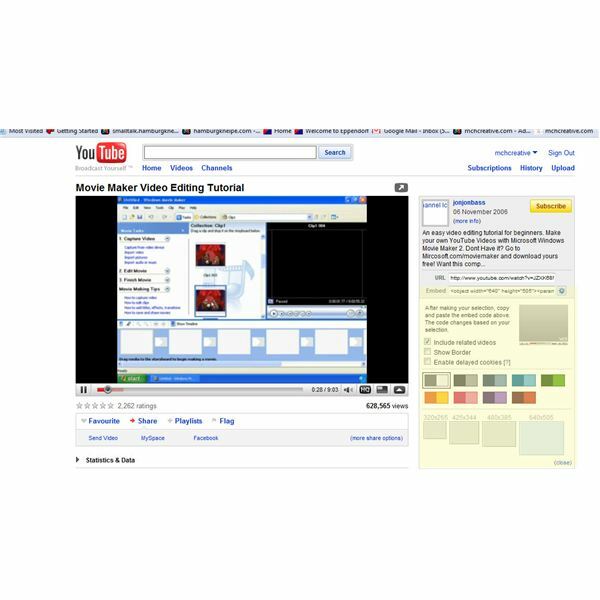 You can make your own videos or display videos from other sources. If you see a video you like, check to see if it has an embed code. If it does, you can follow the steps to add a video to NVU or KomPozer set out here and populate your site with interesting content and add value for your users.